After a successful trial run for specific users in September, Twitter has officially rolled out the increased character count per tweet for everyone. The announcement to increase the tweet count to 280 words was initially made in September. The company cited data to back their claims that the character constraints impacted the users hence it was crucial to make necessary changes. The company representatives also claimed that character constraint had a different impact on people who spoke different languages. For instance, people who tweeted in Japanese, Korean and Chinese were able to express double the amount of information in a single character, compared to users who spoke English, Spanish, Portuguese or French. The announcement looks like an attempt by Twitter to divert the users’ attention from the problems it is facing said Kelley Heider, a crisis communications expert at SSPR. “They change their narrative in the news cycle by responding to user feedback,” she said. But there are potential pitfalls to the new character count, Heider added, particularly if people use the greater length to post even more inflammatory tweets. “It will be pretty interesting to see what President Trump does with it, for sure,” she said. Twitter has been thinking about longer tweets for years but got cold feet back in 2016. 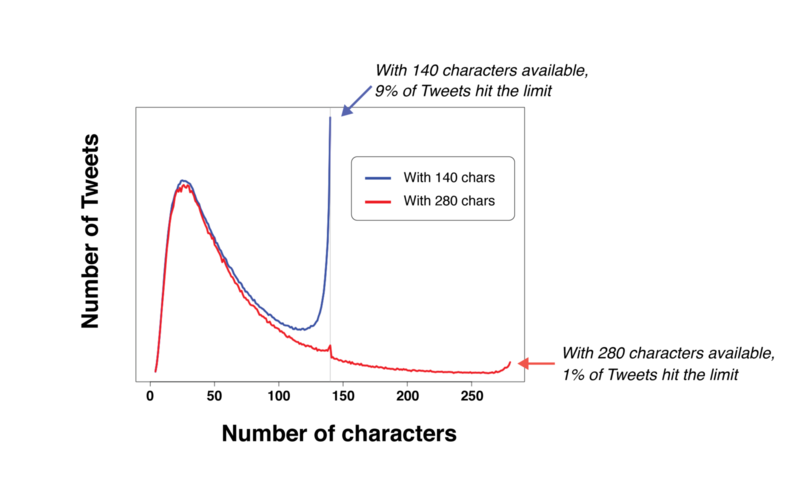 When Twitter announced in September about the increase in character count, a lot of users were worried as what makes Twitter, Twitter is its 140-character count. The company said Tuesday that historically about 9 percent of tweets in English hit the 140-character limit. When the 280-character trial run began, the volume dropped to 1 percent. In the past two years, Twitter has removed the limit on direct messages length. Twitter has also a relaxed limitation on photos, videos, and GIFs. Since we saw Tweets hit the character limit less often, we believe people spent less time editing their Tweets in the composer. This shows that more space makes it easier for people to fit thoughts in a Tweet, so they could say what they want to say, and send Tweets faster than before. This feature is still not available to all users. People who use Twitter in Korean, Japanese or Chinese will still get just 140 characters. Twitter says this is because you can convey a lot more meaning in a lot fewer characters with those languages. A lot of users can be seen on Twitter using the tag #280characters. Still waiting for at least thousand characters limit and 4 hours videos upload.